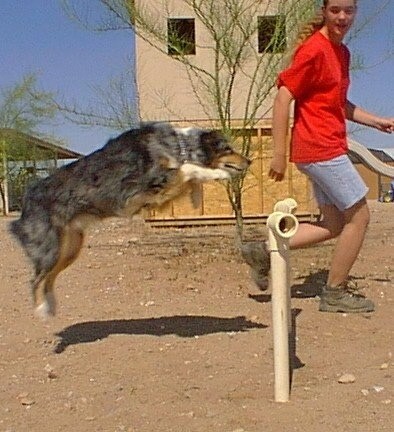 Australian Shepherd Shaylee training for agility, photo courtesy of The Blunderosa. 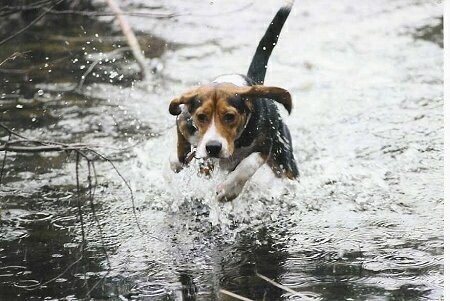 Snoopy (Beagle) running through the water. This is Cracker the American Bulldog who loves to swim after his toy. Cracker the American Bulldog in mid-air, jumping off the dock. Cracker the American Bulldog swimming in the water. Ozzy the Outlaw, a Boston Terrier from Puerto Rico hanging from his rope toy. 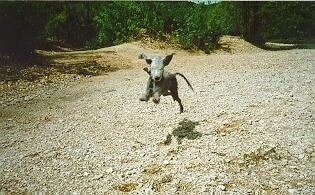 Sherman and his shadow, photo courtesy of Moonshadow Bedlington Terriers.